New Album & The Beginning of Basketball Season | What's Best Audio and Video Forum. The Best High End Audio Forum on the planet! Putting that aside did you all see Boston beat up on Miami? The Big Three. Overestimated and way out of sync. IMO Boston remains the team to beat in the East. There's ALWAYS another Steve Williams BUT there's only "oneobgyn"
"For me, it is far better to grasp the Universe as it really is than to persist in delusion, however satisfying and reassuring." "Any intelligent fool can make things bigger, more complex, and more violent. It takes a touch of genius -- and a lot of courage -- to move in the opposite direction." Who are the key players in Chicago Frantz and what style does the team play? NBA All-Star, Orlando Magic center, Olympic Gold Medalist and humanitarian, Dwight Howard, can add one more credit to his growing list of accomplishments - recording artist. 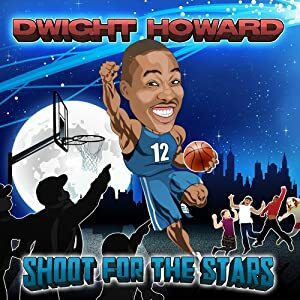 Dwight Howard will release his debut album, Shoot For The Stars. The full-length CD lineup includes MVP worthy recordings of popular arena anthems and classic hits, plus the original song, "Shoot For The Stars," which encourages his young fans to pursue their dreams. On Shoot For The Stars, Dwight is backed by his All-Star Band, featuring some of the industry's most talented musicians and session players, including Grammy winner Luis Conte (Eric Clapton, Santana), Abraham Laboriel (Stevie Wonder, Ray Charles), Leland Sklar (James Taylor, Phil Collins) and Tim Pierce (Bruce Springsteen, Michael Jackson). Also accompanying Dwight on the album is a group of talented young kids who sing backup vocals on each song. Special guests, the KIDZ BOP Kids, join Dwight on Michael Jackson's "Will You Be There." Shoot For The Stars was produced by Latin Grammy nominated producer, Loren Harriet, who also helmed former New York Yankee star Bernie Williams' two critically acclaimed albums. A portion of the proceeds from sales of Dwight's album will go to benefit the BETA Center (www.betacenter.org), the Orlando, FL based organization whose mission is to provide children and parents with the knowledge and support needed for strong and healthy families. Derrick Rose.. Kid is young cool and understands the game... Calm as a veteran who's seen it all. Good basketball IQ, can score, can pass , can rebound. Defense is not that good, not yet anyway. The real deal, one of the league future superstars. Carlos Boozer, very good forward/Power forward. Can score, defend, rebound and play a mean game in the low post. Decent shooter from afar ..
Joaquin Noah, the lightning road, plays all over the field, rebound incessantly , runs up and down the floor in offense or defense, opportunistic player who can frustrate the opposing stars with his constant hounding. Not a scorer, has no shot to speak of but will score off any miss. Always around the ball whomever holding it be it a point guard or a 7', if the ball is around the rim you'll find him there and he never but never tires ..
A fun ream to watch. After beating Miami, Boston fell to a supposed lottery-headed team Cleveland. That's the shock. That game exposed the perennial weakness of Boston, relying too much of the Big 3 for points. They need a consistently scoring bench. Jermaine, Marquis have to contribute in a consistent basis. Only Big Baby Davis is performing well, and technically, he is part of the first 5 as Doc Rivers pay 'lip service' to Shaq by starting him, but Davis ends the game. Miami will have either Wade or James explode for like 25 to 30 points a piece each game to terrorize the league. And at times, the Heat will need BOTH to explode in a game together to be able to challenge the Lakers in the other end. Both Wade and James are 'take-over-the-game' kind of players. Is there room for 2 such players in a team? Picture Lebron or Wade WITH Kobe in the Lakers team. I doubt it will work. Very interesting observation. To answer your hypothetical with Kobe, it may be useful to look at the Olympic gold medal team from '08. In the 4th quarter of the finals, Kobe either scored or assisted on virtually every play. I think LBJ has that same potential with the Heat. LBJ will be playing point guard before season's end, particularly in the 4th quarters, and most assuredly in the playoffs. The Heat's main problem, IMO, is the complete and utter lack of a low post scoring threat. LBJ will be playing point guard before season's end, particularly in the 4th quarters, and most assuredly in the playoffs. The Heat's main problem, IMO, is the complete and utter lack of a low post scoring threat. Very true. James seems to be the 'better' take over guy than Wade. James is bigger, making him play the role of a Magic Johnson type point guard as he has a better view of the court, including spotting a well-positioned Wade in the inner wings. But, yes, the million dollar problem - the 'small' llow post of the Heat. A 6'9" center like Anthony certainly wouldn't be able to do much against the likes of Bynum (when he returns), Gasol, and Odom in the playoffs. But hey, who knows, Michael Jordon didn't have a dominant center like Shaq or Hakeen then, he only had a sidekick named Pippen. Don't underestimate Cartwright, Horace Grant or even Scott Williams from the first 3-peat team or even Luc Longley and Bill Winnington from the second 3-peat. All of these big men had some offensive skill. Not at all. What I meant was a dominant or 'star' quality big player like Shaq, who in those times, was the 'star' player alongside Kobe. Of course, Kobe after the 3rd repeat, would dispute that. Amazingly, these big Bulls players like you mentioned suddenly became real good after coming into Chicago, and you can add Stacey King and Cliff Levingston to that list. Forgot all about Stacey King. I remember him at Oklahoma. Cartwright was pretty decent in NY and Seattle as well. Interestingly enough, as I am typing this posting I'm watching the Heat against the Magic. Heat are up by 24. The Magic are pretenders. Barring a major trade, they'll lose in the second round of the playoffs. Eastern conference finals, barring injury, will be the Heat against the Celtics. Agreed. With 6 min to go in the game, Wade has 26, James has 15 AND 7 assists, that's 14 points to his credit. Bosh, if he scores inside like Gasol does, and consistently, will make the team real strong. Jeez, what about Rondo! 24 assists, 10 points, 10 rebounds. 50 assists in his first 3 games, an NBA record. Wow! Just think what he'll be doing in about 2 or 3 years, after working on his jump shot in the off seasons.